A full house gathered at Salt Lake City’s Rose Wagner Theater last night for the world premiere of Morgan Neville’s “Won’t You Be My Neighbor”, a loving tribute to national treasure Mr. Fred Rogers. Governor Gary Herbert introduced the evening by recognizing Utah as “the state of the arts,” where “we understand culture and how it elevates our lives.” Zions Bank’s Scott Anderson joined Betsy Wallace and the Sundance Film Festival team in welcoming the crowd “to the neighborhood, “ and brought director Morgan Neville up for a quick introduction, before the familiar bells of “It’s a beautiful day in the neighborhood” opened the film, tapping into a collective childhood and inspiring smiles across the crowd. The documentary follows the story of a gentle man who seems at times of another world, fluent in the language of children, adamant in his philosophy of loving one’s neighbor, and brilliant in his command of media to speak to the hearts of a generation. A Presbyterian minister, Rogers delayed seminary training upon discovering television. Despite being turned off by rampant on-air consumerism and the popularity of “pie-throwing” on screen, Rogers recognized the potential of television as an early educational tool. He joined Pittsburg’s burgeoning public television team, and in later years would become integral to saving PBS from Nixon’s war-funding budget cuts – a striking scene to watch play out in Neville’s film. Mr. Rogers Neighborhood and the puppet-populated world of Make-Believe Land developed almost by accident, and quickly became as gently subversive as it was beloved. “He thought about kids as people, not kids,” said Neville of Rogers; he spoke directly to the camera and candidly addressed frightening topics of war, divorce, and assassination in a way that helped parents as well as the small children who devotedly watched. Like most of the audience, as a child I would eagerly await Make-Believe Land every afternoon. I also remember being slightly older and feeling embarrassed by his sincerity, which challenged my developing adolescent sarcasm; his complete lack of defenses wasn’t relatable to my own. He seemed sensitive to the point of perhaps needing a Mr. Rogers himself as a child, and it was unnerving. I remember rediscovering him in recent years, during some political calamity, when a clip of his encouraging us to “look for the helpers” was circulating social media, cutting through the noise with its reason and clarity. His m.o. was, as Neville describes it, “radical kindness”, and his approach to the world – even a world steeped in widespread adolescent angst – was a rare leadership by example. “Where are the adults?” Neville recalls asking himself as he started work on the film a little over a year ago, and upon his first “deep dive” into the extensive Rogers archive, he thought, “This is a voice I want to hear.” It is a velvet voice, instantly evocative of the safety of childhood, and upon revisiting it as an adult, a voice of lucidity sadly scarce in this era of screaming pundits and fake news. In many ways, the legacy Mr. Rogers hoped to leave is in danger of being buried. In interviews for the film, his wife Joanne encouraged Neville not to make Mr. Rogers out to be a saint, cautioning, “If Fred were a saint, that lets the rest of us off the hook”. Indeed, one of the first questions in last night’s Q&A was, “Who is today’s Mr. Rogers?” Neville’s answer? “We are.” When it comes to tending to the people in our neighborhood, as Mr. Rogers taught us, it is up to us. 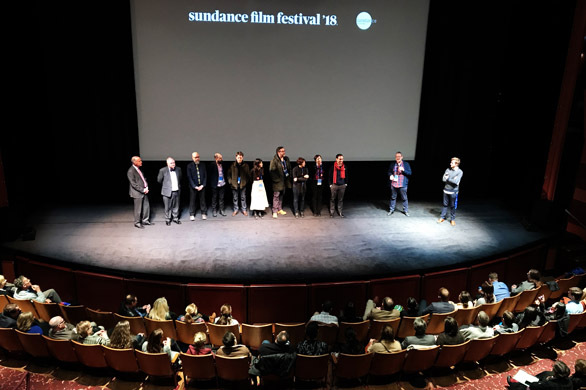 Sundance '18: Location, location, location!